This aircraft was the production version of the H-2 model and the last in the development sequence of ram-jet powered rotorcraft beginning with the NHI H-1. All the aircraft in this family were built upon patents held by Jan Meijer Drees. The aircraft was certified (in the Netherlands) in March 1958. The aircraft had a 1-bladed tail rotor to provide directional stability (no anti-torque capability was needed as the rotor was directly driven by the ram-jets at the tip of the blades). Note: In some references the aircraft is named as 'Kolibri'. 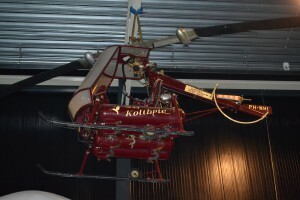 The name 'Kolibrie' is assumed to be correct as this is the name shown on the aircraft in various images. Design authority: Nederlandse Helicopter Industrie N.V.
Primary manufacturer: Nederlandse Helicopter Industrie N.V.
Resources related to the H-3 Kolibrie, provided by the Vertical Flight Society. Resources related to the H-3 Kolibrie, provided by public sources across the internet.